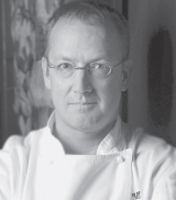 All that jazz: Bix chef Bruce Hill also oversees Larkspur's Picco and adjacent Pizzeria Picco. Summer is in full swing, and gardens across the North Bay are bursting with goodness--beautiful basil, cucumber, garlic, green beans and the first tomatoes of the season, just to name a few. Such a cornucopia is just one of the many reasons we live in this magical place. Another reason we call the North Bay home is that we've got so many talented chefs to guide us on what to do with this grandeur. Chefs who grow their own ingredients obsessively source out the best of everything from salt to olive oil and know how to put them together in such inspired style that even the most simple dish sings. We asked three of our great chefs to share their favorite recipes of the moment, within just a few basic parameters. One, the ingredients should be the stars--no foam or froufrou. Two, that preparations be something a normal person (not that chefs aren't normal, of course) could do. And three, that the results would be light (no heating up the kitchen, please), lively, and so delicious we would want to prepare them again and again. Picco, 320 Magnolia Ave., Larkspur. 415.924.0300. Pizzeria Picco, 320 Magnolia Ave., Larkspur. 415.945.8900. Bix, 56 Gold St., San Francisco. 415.433.6300. Picco chef-owner Bruce Hill has worked at some of America's most impressive restaurants and now owns three of his own in the Bay Area. He caught our eye at the recent Golden Glass event in San Francisco (go, Slow Food!) and with his commitment to using locally grown organic produce whenever possible. Hill also favors the Asian twist. He's spent time in Japan, and in October is heading back for a tour as San Francisco's culinary ambassador. This dish is inspired by that country's cooking, he says, "where the simple combinations often add up to deep flavors." Hill prefers Mariquita Farm (Watsonville) tomatoes, especially the Early Girls, hailing them as "the benchmark of tomato flavor." Pair this salad with a lush, fruity Daiginjo sake. Sauté the garlic in olive oil over medium heat (10-15 minutes), watching carefully so it doesn't burn. As soon as the garlic turns golden brown, add the mirin (it will bubble and boil). Remove from heat, add the miso and rice vinegar, whisk until smooth. Lightly dress the arugula with toasted garlic miso vinaigrette, and mound evenly in the center of 4 plates. Season the tomato slices with salt and pepper and arrange around the arugula. Drizzle some vinaigrette on each of the tomato slices and garnish with basil oil or torn basil leaves. 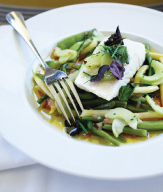 Stemmed: Victor Scargle's beans and halibut make a summer poem on a plate. Cafe St. Rose, 463 Sebastopol Ave., Santa Rosa. 707.546.2459. Cafe St. Rose owner Mark Malicki isn't hung up on pretension. His tiny shop opened late last year on an unlikely residential/commercial street in downtown Santa Rosa. There are only about 15 seats in his shabby-chic space, and the bare bones menu changes daily, reflecting what's good in the market plus, well, whatever Malicki feels like serving that night. Usually, it's prix fixe; sometimes there are choices on courses, and sometimes not. One thing is certain: the dishes will be out of the ordinary, with surprisingly effective out-of-the-hat combinations and casual, almost careless respect for "cuisine." Not surprisingly then, Malicki veered a bit from one of the constraints we put on him; local just wasn't his bag that day. But simple? Check. And luscious? Check, check, check. Malicki's recipe comes from a fishing trip he took last year in Redding. He caught some brown trout and turned it into breakfast, though it turns toward dinner with a suggested pairing of a fennel and radish salad. The ham he likes lately is Smithfield from Virginia, the salt is Halen Môn 100 percent natural smoky Welsh sea salt, and the olive oil is Spanish because, as Malicki says, "To be frank, Spanish oil has lots of similarities [in quality] to Italian, but it's priced a lot better." Cut the head and tail off the trout. Stuff fish with ham, and season with salt inside and out. Heat the oil in a large sauté pan over medium heat, add the fish and cook for three minutes. Carefully flip the fish over with a spatula and cook for two more minutes. Remove from pan and serve immediately. Go Fish, 641 Main St., St. Helena. 707.963.0700. With three talented chefs in the Go Fish kitchen, it might be challenging to come up with one simple, stunning recipe everyone can agree on. The big names partnering here include Cindy Pawlcyn (Mustards Grill and Cindy's Backstreet Kitchen), Victor Scargle (lured away from COPIA's Julia's Kitchen last winter) and Ken Tominaga (owner of Hana Japanese Restaurant in Rohnert Park). Ultimately, they let Mother Nature name the dance, then leave it up to executive chef Scargle to choreograph. "Here in Napa, we take advantage of the seasons," Scargle says. "Right now we've got so many beautiful fresh beans, herbs and cucumbers." He plucks his own from the organic garden behind the restaurant. Key to the recipe is the grapeseed oil verjus, from Napa grapes. "It's different from vinegar and has a nice acid," Scargle explains. Mix verjus, shallots and 1/2 c. of grapeseed oil. Season with salt and pepper to taste. Method: Bring heavily salted water to a boil, and cook beans in separate batches for four minutes each. Remove and blanch in ice water. Drain and pat dry. Place herb stems, coriander seed and fennel seed in a cheese cloth and place in a saucepan with 2 quarts of grapeseed oil and bring to a simmer. Add diced fennel. Simmer for 15 minutes, strain fennel out and keep warm. Season halibut with salt all over, white pepper on the skin side. Return grapeseed oil blend to heat, but do not let boil. Add fish and cook 8 to 10 minutes depending on thickness. While fish is cooking, heat vinaigrette. Add beans and simmer until slightly tender, then add reserved fennel. Add chopped chives, chervil, parsley and tarragon. Remove beans from vinaigrette with a slotted spoon, and place on center of plate. Remove fish from oil and lightly blot on paper towel. Season fish to taste with salt, and place on top of beans. Finish with a grapeseed oil drizzle around the plate.